These twenty-five words are the bedrock prayer of the worldwide Alcoholics Anonymous movement, a movement that has saved and improved millions of lives. When Barb Rogers first heard this prayer a quarter of a century ago, she could scarcely credit it and hadn't the ears to believe it. It all begins with "meee, meee, mee," she writes. As in, Why is God doing all these things to meee? Why doesn't God understand that I know what's best for mee and do what I ask him to? Why are other people doing all these things to mee? Well, as it turns out, it's not all about "meee." Rogers tells her story and invites readers to take a tough, loving look at their own. There are some things we should accept, period. We shouldn't take them personally. We shouldn't whine or scream or go off on a tear. Then there are some things we can change, and we should probably take a look at those as well. And the real trick, the one that comes from years of saying the prayer and letting its healing principles sink in, is knowing the difference. Once we make room in our lives, letting go and letting God, all kinds of things can happen. Barb Rogers' own story starts in the depths of alcoholism, with deceased children, broken marriages, lost jobs. Sure there were reasons, but reasons didn't change anything; the Serenity Prayer did. 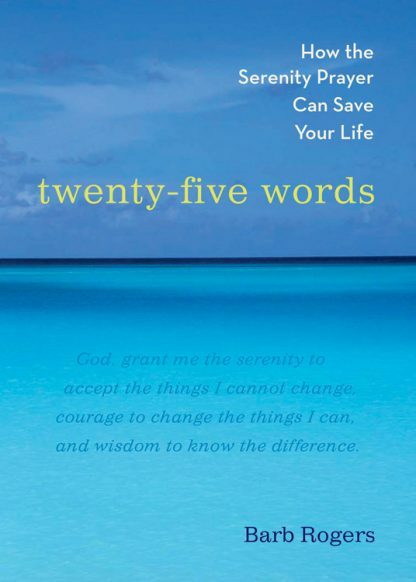 A down-home, nitty-gritty, get-real guide to living the Serenity Prayer.